Growing support for Philip’s ‘Message in a Bottle’ plastic campaign | News by Wales Express News, People Before Profit! The organiser of the ‘Message in a Bottle’ campaign to reduce the use of plastics in the ancient Mid Wales market town of Llanidloes is delighted with growing public support and the progress being made. Philip Stallard delighted with the response to the ‘Message in a Bottle’ campaign. Philip Stallard says two takeaways in the town are now offering customers paper wrapped food instead of polystyrene and the response has been “brilliant”. “The campaign is still going well and Llanidloes remains almost litter-free due to reduced littering and more people doing their own litter-picks as they go for walks,” he said. “The cobbles beneath the Old Market Hall in Llanidloes have been kept clean by volunteers since our launch day and pavements and gutters outside our shops and pubs are also being kept clean by our marvellous business owners and publicans. Having launched a poster campaign for takeaways in Llanidloes, he is now extending it to all businesses in the town and surrounding villages to encourage them to reduce their use of plastic. The campaign aims to educate children and their parents to stop buying so much plastic, to remove rubbish from the River Severn and make Llanidloes litter free and to pick up litter on Mid Wales beaches. Philip’s campaign was prompted by David Attenborough’s Blue Planet II TV series, which broadcast alarming images of discarded plastics polluting oceans. 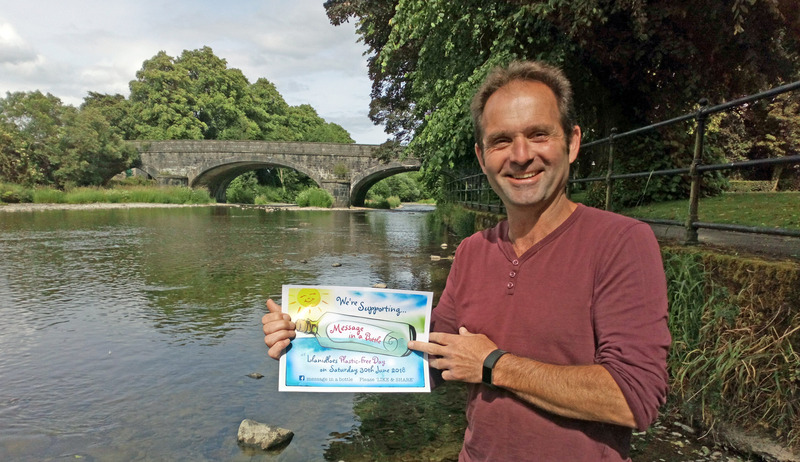 Since 400 children and adults attended the ‘Message in a Bottle’ launch this summer, he has since been in touch with Newtown and Welshpool Town Councils to encourage them to get involved in the campaign, which he hopes to spread downstream to towns along the River Severn. He has also held a series of meetings with organisations and businesses, with some exciting news in the pipeline about widening the campaign. A campaign website will go live next month which will include a video of the launch event, a series of action plans for towns and schools and suggested lesson plans from Llanidloes Primary School. Having taken part in a national beach clean on September 16 with the Marine Conservation Society, which included a survey of the plastic collected, he is now organising a 100-mile survey of plastic flood debris along the Severn across Powys and Shropshire. Anyone wishing to support the campaign should contact Philip on email: philipstallard@btinternet.com.